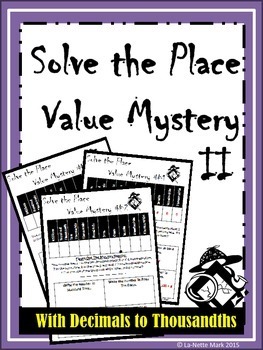 Solve the Place Value Mystery II guides the students on a number journey by allowing the students to plug in the numbers in the correct location with decimals to thousandths for more advanced concepts. 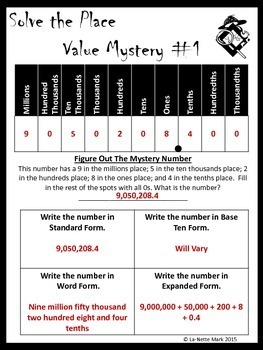 Once the students figure out the number, the students will further engage the different forms by writing the standard form, base ten form, word form and expanded form of the mystery number. Ten worksheet with different numbers are included. This is a GREAT way for students to practice their place value skills! Click Here to see my Place Value Without Decimals. Follow Me to be notified of new teaching resources, flash freebies, and great deals by clicking the star up at the top right by my logo. Copyright © La-Nette Mark. All rights reserved by author. This product is to be used by the original downloader only. Copying for more than one teacher, classroom, department, school, or school system is prohibited. This product may not be distributed or displayed digitally for public view. Failure to comply is a copyright infringement and a violation of the Digital Millennium Copyright Act (DMCA). Some Clipart and elements found in this PDF are copyrighted and cannot be extracted and used outside of this file without permission or license. Intended for classroom and personal use ONLY. If you download this product, please take some time to rate it and provide me with some feedback. As well, please consider becoming a follower of my TpT store so that you will receive notification when I post more resources to the TpT site. If your find errors, please allow me the chance to fix it before leaving a bad rating. You can contact me at tlmark1968@gmail.com Thanks for your support and business!